(Michael Cantrell) As soon as the riots and looting started after black teenager Michael Brown was shot and killed in Ferguson, Missouri, race baiters began seizing the opportunity to stir up strife and division while lining their pockets. The Rev. Al Sharpton wasted no time hopping on a plane to Ferguson, ready to aggravate the already tense crowds with his highly charged race rhetoric. Black leaders in the city, along with the mayor, have all stated that they are uneasy by Sharpton’s presence, scared that he will only make matters worse. Apparently, Sharpton isn’t the only one who saw dollar signs when learning of Brown’s death. 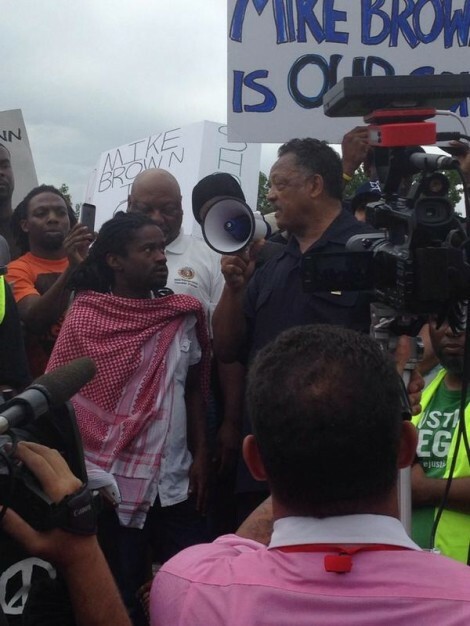 According to WZ, Jesse Jackson made an appearance in Ferguson, delivering a speech and asking for the good people of the town to dig deep into their pockets for a few coins to drop in his coffers. In truth, these individuals are not crusaders, but opportunists, and it’s great to see the crowd recognize Jackson for what he really is. Hopefully, as time goes on, people will continue to see through the false sense of justice Jackson and his buddy Sharpton spew on the masses and shut them down once and for all. Please share this article on Facebook and Twitter if you agree that Jesse Jackson is an opportunist attempting to make money off the tragic death of a black teenager.